The 2012 Chicago Air & Water Show will roar back to life over the next few days leading up to the 54th Chicago Air & Water Show this weekend. The headline act, the U.S. Navy Blue Angels, will arrive Wednesday night to begin preparing for the show. Most of the civilian and military acts will be based at Gary International Airport through the weekend and make the short flight up the lakefront for their Chicago Air & Water Show practice schedule and for the main event. Expect record crowds this weekend as the forecast currently shows unseasonably cool but comfortable weather for the airshow weekend. The good news is the nearly two million people that attend the show annually will have two beautiful days to choose from as both days currently look rain free. For many one of the best places to check out the show is the fenceline at Gary International. However, if you plan to view the show from the lakefront then check out Chicago Air & Water Show Viewing Guide with a few recommendations for the best place to view the show. Expect to hear planes flying overhead on Thursday for media day and Friday for a full practice show. The show will start at 10am both Saturday and Sunday and run until 3pm. If you are an airshow regular you will recognize many of the acts on this years lineup. The civilian acts include perennial favorites like Lima Lima Flight Team, Sean D. Tucker & Team Oracle, AeroShell Aerobatic Team & the Firebirds to name a few. Red Bull has often sponsored an act or two including Chuck Aaron in his aerobatic helicopter. Joining him this year and making their Chicago Air & Water Show debut will be the Red Bull Air Force performance skydiving team. They will jump from high over the lakeshore and speed to North Avenue Beach in their Wingsuits and surely be a thrilling addition to this year's show. U.S. Navy Blue Angels, U.S. Army Golden Knights and U.S. Navy Leap Frogs will headline the show and represent our armed forces. Expect demonstrations by pilots of F-16s, T-38s, an F-4 Phantom and KC-135 Stratotanker to name a few. I became huge fans of the U.S. Army Golden Knights last year when I got to spend a few days with them. During the show I road along in their Fokker C-31A Troopship as the jumped from 10,500 feet above the lakefront. Then a few weeks later I was able to join them for a tandem skydive. See what is it like to skydive with the U.S. Army Golden Knights. As the show approaches I will be meeting with many of the teams and flying with a few and look forward to sharing updates and news about the 2012 Chicago Air & Water Show. Feel free to e-mail me send me a tweet if you have a question about the show. 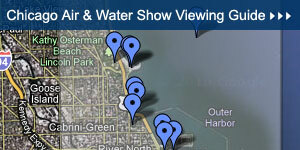 You can stay up to date with my airshow updates on the MyFlightBlog Chicago Air & Water Show Ultimate Guide. Hi, Its a good article for pilot training. Nice work. I guess, that jumping with a parachute could be interesting a lot. I plan to do this in a close future.